Gospel music has reached the world level today: Here the Oslo Gospel Choir performs. Gospel music is a genre of mostly American music characterized by dominant vocals (often with strong use of harmony) drawn from Christian worship and often featuring Christian evangelical lyrics. Two major types of Gospel music have developed along basically racial lines. These include Urban Gospel (sometimes referred to as "black Gospel") and its white counterparts, among them: Southern Gospel and modern, popularized Gospel (now more commonly known as "praise music" or Contemporary Christian music). The creation, performance, significance, and even the definition of Gospel music varies according to culture and social context. It is composed and performed for many purposes, ranging from aesthetic pleasure, religious or ceremonial purposes, or as entertainment for the marketplace. However, a common theme is praise and thanks to God and/or Christ. Gospel music has played an anomalous role in American race relations. Black gospel was a synthesis of African-based musical idioms and traditional European Christian hymns, and came to maturity during the era of slavery. Southern gospel, in contrast, came to embrace some of the tempos and emotional freedoms of the black gospel tradition. While following largely separate paths, black and white gospel music have emphasized the spiritual, as opposed to secular, aspects of love and contributed to greater understanding and respect between the races, particularly during the American Civil Rights movement. Many millions of people around the world have been inspired by Gospel music. It has comforted those in times of trouble, guided lives thorough its inspirational message, and for some directly fulfilled a personal search for God. The relationship between the origins of white and African-American Gospel music is a matter of some controversy. Some argue that Gospel music is rooted in Africa and was brought to the Americas by slaves. However, Gospel harmonies and many of the hymns themselves also show a clear Scottish influence. Recent studies by Professor Willie Ruff, an Afro-American ethno-musicologist at Yale University, conclude that African American Gospel singing was in fact was encouraged by Scottish Gaelic speaking settlers from North Uist Thus, traditional Scottish Gaelic psalm singing, in which the psalms are called out and the congregation sings a response, may have been the earliest form of congregational singing adopted by Africans in America. Call-and-response singing, however, has also been found among many African tribes, and it is certain that the southern slave culture adapted African traditions to the Christian songs they were taught by their slave owners. Although white and black Gospel singing may have grown up side by side and cross-fertilized to a great extent in the south, the sharp racial division in the United States, particularly between black and white churches, has kept the two apart. While those divisions have lessened slightly in the past 50 years, the two traditions are still distinct. In the early twentieth century, recordings of Gospel songs began to create a market for Gospel music in the emerging recording industry. Gospel and spiritual songs by white groups such as the Carter Family and Gospel blues by such performers as Blind Willie Johnson and others were among these. In the 1930s and 1940s, the Grand Ole Opry regularly featured bluegrass and traditional Gospel singing, while pioneer Urban Gospel performers began to gain popularity among black audiences. By the mid-twentieth century, Gospel music had developed a major market. Soon, distinct sub-genres began to appear. Cross-over performers such as Amy Grant and Aretha Franklin brought their Gospel traditions with them into mainstream country and R & B, while occasional Gospel mega-hits such as "Oh Happy Day" by the Edwin Hawkins Singers reached the top of the pop charts. Today, Gospel music is no longer a Sunday-only affair, but a major part of the recording industry in the United States. Although predominantly an American phenomenon, Gospel music has also spread throughout the world including to Australia, with choirs such as The Elementals and Jonah & The Whalers and festivals such as the Australian Gospel Music Festival. 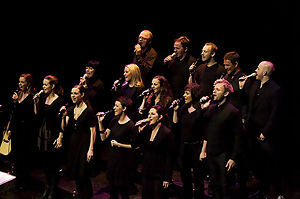 Norway is home to the popular Ansgar Gospel Choir, the only true Norwegian Gospel choir. Gospel is also popular in the province of Quebec, Canada, where important gospel choirs such as Montreal Jubilation Gospel Choir are famous. Urban Gospel had its roots mostly in spirituals sung by southern slaves during the eighteenth and nineteenth centuries. Thomas A. Dorsey ("Take My Hand, Precious Lord") and other pioneers popularized the more freewheeling form of religious devotion of "Sanctified" or "Holiness" churches. In the 1920s, artists such as Arizona Dranes, many of whom were also traveling preachers, started making records in a style that melded traditional religious themes with blues and boogie-woogie techniques and brought jazz instruments, such as drums and horns, into the church. Early Urban Gospel music of this nature was often frowned upon in more established black churches, which preferred traditional Baptist and Methodist hymns without rhythmic accompaniment. In the mid-twentieth century, groups such as the Dixie Hummingbirds, Soul Stirrers, Swan Silvertones, the Five Blind Boys of Mississippi, and the Mighty Clouds of Joy introduced even more stylistic freedom to the genre, often emulating R & B forms, and in turn influencing top popular performers such as Wilson Pickett, James Brown, and Sam Cooke, who himself had been a member of the Soul Stirrers. At the same time that these quartet groups were reaching their zenith, a number of female singers were achieving stardom. 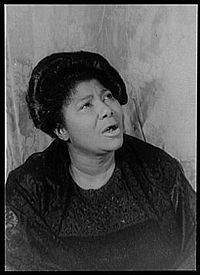 Some, such as Mahalia Jackson and Bessie Griffin, were primarily soloists. Others, such as Clara Ward and The Caravans sang in small groups. Roberta Martin led groups that featured both men and women singers and sponsored a number of individual artists, such as James Cleveland, who went on to change the face of Gospel in the decades that followed with his large choral arrangements in the Urban Gospel style. In the 1960s, Urban Gospel started to break way from the traditional church setting. More artists emerged during these decades, and they often began to perform, more than to minister. More recently, younger artists such as BeBe (Benjamin) and CeCe (Cecilia) Winans and groups, such as Take 6, deliver music Gospel music with a hip hop flavor. Contemporary Gospel songs are usually written in the sub-genre of either "praise" or "worship"—the former being faster in tempo, stronger and louder, the latter being slower in tempo and more subtle so the message may be taken in. Southern Gospel's establishment as a distinct genre is generally dated to around 1910, when the first professional quartet was formed for the purpose of selling songbooks for the James D. Vaughan Music Publishing Company. However, the style of music itself had existed for at least 35 years prior. 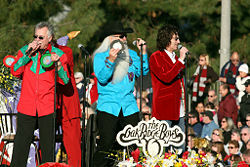 The Oak Ridge Boys originally sang Southern Gospel exclusively, although they later performed country music as well. Southern Gospel is sometimes called "quartet music" by fans due to the original all male, tenor-lead-baritone-bass quartet make-up. Early quartets were typically accompanied only by piano or guitar, and in some cases a piano and banjo. Over time, full bands were added and even later, pre-record accompaniments were introduced. Early Southern Gospel artists such as The Speer Family, The Blackwood Family, The Lefevre Trio, and The Carter Family achieved wide popularity through their recordings and radio performances in the 1920s through the 1950s. Others, such as Homer Rodeheaver, George Beverly Shea, Cliff Barrows, or the Cathedral Quartet, became well-known through their association with popular evangelists such as Billy Sunday, Rex Humbard, and Billy Graham. Christian Country music, sometimes referred to as Country Gospel music, is a sub-genre of Gospel music with a country flair, is also known as Inspirational Country. It originated as a blend of early mountain music, cowboy music, and the music from the plantations of the Deep South. It was out of this blend of music that Southern Gospel music was birthed and was found primarily in the southern states. Today, Christian Country music has blended with a new brand of music called Positive Christian Country music. Christian Country music was recorded by groups such as the Oak Ridge Boys, The Cook Family Singers, Ray Price, Red Sovine, The Louvin Brothers, and The Carter Family. Many secular country music artists have recorded Country Gospel songs or have performed them on their radio and television programs. Tennessee Ernie Ford was known for including these types of songs at the conclusion of his weekly television show which in turn became one of the most successful segments. Other shows like, The Barbara Mandrell and the Mandrell Sisters Show, and the Statler Brothers implemented the same programming style. The Grand Ole Opry, one of country music's longest running and most popular shows, has always included Gospel music as a part of its program. Progressive Southern Gospel grew out of Southern Gospel over the past couple of decades. The style can trace its roots to groups like the Nelons in the 1980s, who appeared regularly on events with traditional Southern Gospel groups despite their sound which was called "middle of the road" at the time. Current Progressive Southern Gospel is characterized by its blend of traditional Southern Gospel instrumentation with elements of modern Country and pop music. Hints of other styles are frequently employed in the mix as well. In some Progressive Southern Gospel, you can hear a touch of Cajun, Celtic, Bluegrass, or even Southern Rock. Where traditional Southern Gospel more often emphasizes blend and polish, Progressive Southern Gospel tends to be presented with a more emotional tone. Vocalists are known for experimenting, stretching, scooping, slurring, and over-accentuating melodies and diction. Lyrically, Progressive Southern Gospel songs are patterned after traditional Southern Gospel in that they maintain a clear evangelistic and/or testimonial slant. In many cases, lyrical content and/or Country diction are the only elements separating a Progressive Southern Gospel artist from a pop oriented, Contemporary Christian music artist. Sometimes considered outside the realm of Gospel music, Contemporary Christian Music is a genre of popular music which is lyrically focused on matters concerned with the Christian faith. The term is typically used to refer to the Nashville, Tennessee-based pop, rock, and worship Christian music industry, currently represented by artists such as Amy Grant, Avalon, Chris Tomlin, Jars of Clay, Jeremy Camp, MercyMe, Michael W. Smith, Petra, Rebecca St. James, and others. The industry is represented in Billboard Magazine's "Top Christian Albums" and "Hot Christian Songs" charts, and by Radio & Records magazine's Christian AC (Adult Contemporary), Christian CHR (Contemporary Hit Radio), Christian Rock, and Inspirational (INSPO) airplay charts. Bluegrass Gospel music is simply Southern Gospel music performed by a bluegrass band, sometimes with bluegrass arrangements. Early bands such as those of Bill Monroe and the Stanley Brothers often set aside their banjos and fiddles to sing Southern Gospel quartet arrangements of both traditional and original songs. Later, Gospel singing was incorporated into normal bluegrass arrangements. In the last quarter of the twentieth century, several groups emerged that specialized in bluegrass gospel, the best known being Doyle Lawson and Quicksilver. Most bluegrass groups still include one Gospel song in every set they perform on stage and include a Gospel track on every album. Gospel blues is a blues-based form of Gospel music featuring a combination of blues guitar and spiritual or Christian lyrics. Many early blues performers included Gospel blues in their repertoire. 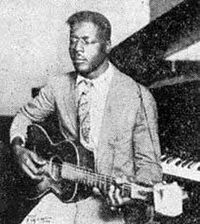 Some, like Son House, Blind Willie Johnson, and Skip James straddled the fence between religion and the blues, sometimes working as preachers and Gospel singers but also playing professionally as blues singers. Others, like the Reverend Gary Davis, played Gospel blues only, considering traditional blues to be satanic. In these cases, it was usually a question of lyrical content rather than music form that was the issue. However, Gospel blues performers often steer clear of dance-oriented blues styles such as 12-bar shuffles-beat song and boogie-woogie dance tunes. Gospel music is a popular adaptation of sacred music that has advocated Christian beliefs and encouraged the practice of Christian ethical principles, both within the framework of worship services and as a form of musical entertainment. The black gospel tradition has borrowed heavily from secular blues, but many gospel artists, such as Mahalia Jackson, refused to sing secular blues despite commercial incentives. Gospel music has adapted to musical tastes through the development of a number of sub-genres, while retaining its moral and spiritual framework. It has also been important in the improvement of race relations in the United States, drawing on the biblical prophetic tradition to emphasize justice for the oppressed, particularly during the civil rights era. Jackson, for example, sang before 250,000 people at the 1963 March on Washington, during which Martin Luther King, Jr. delivered his famous "I Have a Dream" speech. Some of the most popular recording artists of the twentieth century, most notably Elvis Presley, also recorded gospel music out of admiration for the music and as an expression of personal faith. In the twentieth century, gospel music has resisted the near-ubiquitous emphasis on romantic love and sexuality among popular music genres and instead advanced a message of God's grace and love, ordinarily within the context of Christian faith. ↑ Willie Ruff, The line connecting Gaelic psalm singing & American Music, Line Singing Conference at Yale, 2007. Retrieved December 19, 2007. Boyer, Horace Clarence. How Sweet the Sound: The Golden Age of Gospel. Elliott and Clark, 1995. ISBN 0252068777. Broughton, Viv. Too Close To Heaven—The Illustrated History Of Gospel Music. Midnight Books, 1996. ISBN 1900516004. Brumley, Albert E. and Brumley, Goldie E. The Best of Albert E. Brumley. Powell, Mo: Albert E. Brumley and Sons, 1966. OCLC 51089914. Darden, Robert. People Get Ready: A New History of Black Gospel Music. Continuum International Publishing Group, 2005. ISBN 0826417523. Heilbut, Anthony. The Gospel Sound: Good News and Bad Times. Limelight Editions, 1997. ISBN 0879100346. Zolten, Jerry. Great God A' Mighty! : The Dixie Hummingbirds - Celebrating The Rise Of Soul Gospel Music. Oxford University Press, 2003. ISBN 0195152727. This page was last modified on 27 June 2017, at 16:04.